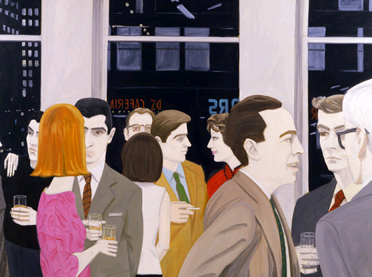 Detail from "The Cocktail Party," Alex Katz, 1965. Image via Picker Art Gallery. They found that engaging in brief (10 minute) conversations in which participants were simply instructed to get to know another person resulted in boosts to their subsequent performance on an array of common cognitive tasks. But when participants engaged in conversations that had a competitive edge, their performance on cognitive tasks showed no improvement. The other day I read that being amused boosts cognition as well. People, if we want to be smarter, we need to tell each other more jokes as part of our cocktail party chit-chat. Tonight's the office holiday party. It will be my mission to tell the penguin joke I've been teaching the kids to contribute to the general intellectual welfare of society.